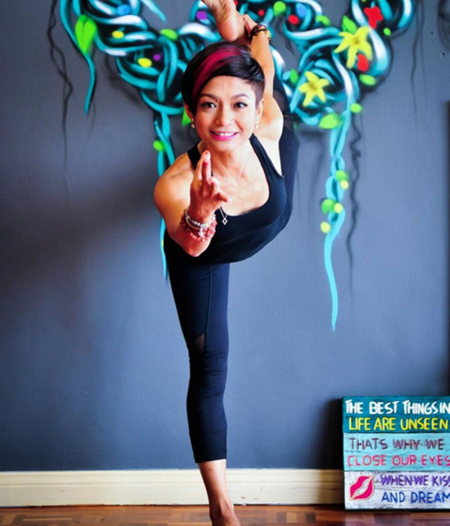 Atilia is a RYT 200 (Registered Yoga Teacher) and the founder of the Yogaonethatiwant (YOTIW) chain of yoga studios spanning 11 various locations in Malaysia. She is also a brand ambassador for Under Armour. Her yoga style has its roots in Vikasa Yoga and she mixes it up with power flows and a good measure of her own personal style. Always seen with a huge smile on her face and an infectious passion for all things yoga, this fun-loving yogi’s journey started on a far less happy note. Plagued with chronic back pains and shortness of breath, Atilia turned to yoga for an answer to her mounting health problems. She discovered that yoga had the ability to greatly reduce anxiety and improve breathing, which in turn proved invaluable in her singing career. Yoga also helped to improve her overall fitness and mental strength, enabling her to remain energised and focused in spite of her hectic schedule. In addition to her yoga empire, Atilia is also an accomplished singer/songwriter and recording artiste. She has made appearances at major events such as the World Economic Forum in Davos and the US-Asean Summit Gala Dinner, performing for world leaders and luminaries.